Over the past decades, previous city councils under NPA and COPE have been pressured to recognize the DTES as a valuable community and a much-needed reserve of affordable housing. In the midst of a city-wide housing crisis, the high concentration of low-income affordable housing has been viewed as an asset to Vancouver, and a last stop before homelessness. Until now, city policies were drafted with a principle of “revitalization without displacement” for the Downtown Eastside, reflected on paper in the 2005 DTES Housing Plan. However, the new LAP policy abandons “revitalization without displacement” both in practice and on paper. With the unanimous Vision-NPA approval of the LAP, the City has made a broad policy decision to not accommodate the total need for social housing in the downtown Eastside, but to instead disperse at least 36% of existing residents to other parts of the city through private market rent subsidies and “scattered-site” social housing. However, the new city-wide definition of social housing approved by the LAP stipulates an anti-poor definition of affordability for all scattered units. According to the definition put forward by the LAP, not one single unit of “social housing” outside the DTES will be required to rent at the welfare shelter rate. The City’s cartoon of the number of low-income residents to be accommodated in the DTES vs. those dispersed. 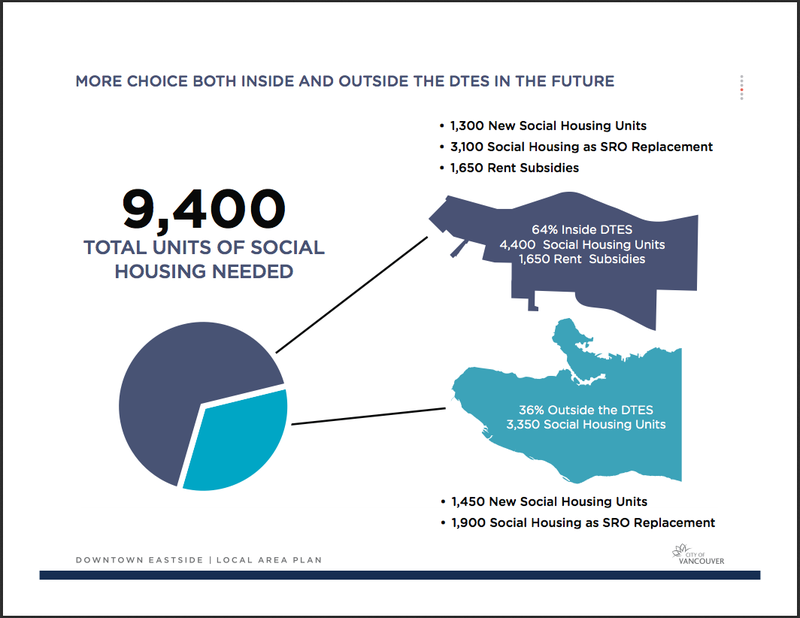 While the plan commits to building 4,400 “social housing” units inside the DTES over the next 30 years, only 30% of these units will rent at the shelter rate. The rest of the “social housing” will rent at market rates beginning at $875 per month. This is a clear contrast to the demands by the LAP low-income caucus, identifying the need for at least 5,000 new social housing units at welfare rate in the DTES over the next five years in order to halt the current tide of displacement. Recently the BC provincial government has joined the Harper government in announcing the termination of its social housing program in favor of free-market rent vouchers. Vision’s Local Area Plan accommodates this shift, both by eliminating a working definition of social housing, and by outlining a plan for scattered displacement. The Downtown Eastside plan uses the two main “deconcentration” strategies identified by the Canadian Centre for Policy Alternatives: dispersal programs and social mixing. “While dispersal programs seek to decentralize and scatter lower income households into more affluent areas,” writes the CCPA, “mixed-income development programs aim to bring higher-income groups into economically disadvantaged areas.” The practice of “dispersal programs” is imported from the United States where governments have been dismantling inner-city neighbourhoods since the race riots of late 1960s. This dispersal plan – along with displacement caused by the free market – will be implemented in traditionally Chinese neighborhoods like Strathcona and Chinatown. Unlike the Oppenheimer district, new re-zonings for Chinatown will not stipulate any inclusionary zoning for social housing. Strathcona, for its part, will now be modelled on neighborhoods like Shaughnessey, where high-value single-family homes are protected and social housing is prohibited. The LAP halts large market re-development in Strathcona except on existing social housing sites. The plan makes it clear that a “P3″ redevelopment of social housing at Stamps Place and McLean Park in particular is in the works. The first iteration of the DTES redevelopment plan came during Sam Sullivan and the NPA’s EcoDensity push for towers in key areas of the city, 2005-08. During its term the NPA hired consultants to write a proposal for towers throughout the Downtown Eastside. The resulting document was called the Historic Area Height Review. When Vision came to power in November 2008, they embraced EcoDensity and the NPA’s overall DTES plan. When the NPA-era Height Review finally came to council for approval in the spring of 2011, Vision threw its support behind condo-gentrification of the Downtown Eastside, including seven new 15-storey towers. A neighbourhood coalition opposed the tower plan because it contained no protections against the displacement of the low-income community. Advocates were particularly concerned about the social impact of condo towers in the neighbourhood, given the massive loss of low-income housing surrounding the new Woodward’s development. On January 20th, 2011, over 80 residents signed up to speak against rent-hikes and displacement at the Height Review public hearing. At 4a.m. the night before the hearing, Vision made a decision to split the tower plan into two parts. On the one hand, Vision resolved to move forward with the the five towers proposed for Chinatown, including condo developments by Westbank, Bosa, and Solterra that are all now under construction. Vision stated that it was their prerogative to move forward “boldly and decisively” with the condo-gentrification of Chinatown, to use the words of Councilor Raymond Louie. On the other hand, Vision deferred the approval of two towers on Hastings and Pender streets. The larger tower was a proposal by Rob MacDonald, who then became the chief fundraiser for the NPA’s 2011 campaign. (The deferred rezoning for both of these properties has now been passed with the approval of the LAP). 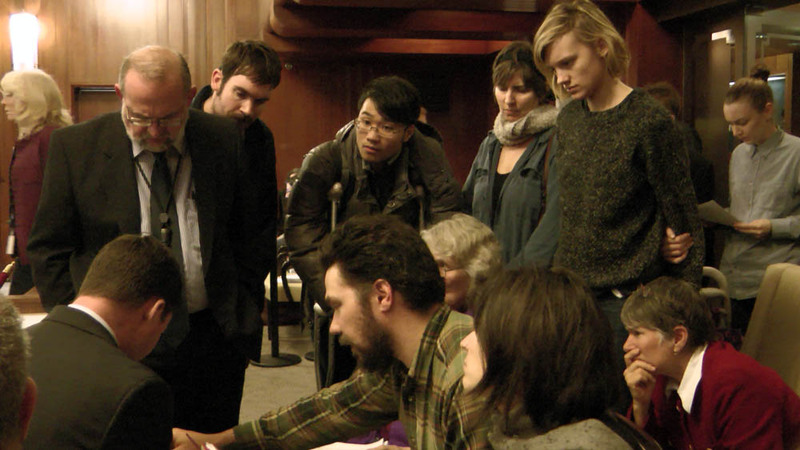 At the meeting on January 20th, 2011 Vision also voted to create an advisory committee to launch a Local Area Plan for the entire DTES neighbourhood, which initiated the LAP as we know it today. One of the co-chairs of the new LAP committee was Ray Spaxman and the other a representative from the Downtown Eastside Neighbourhood Council. This apparent concession to the low-income fightback against the tower plan should be seen in the broader context of Vision’s city-wide gentrification agenda in the spring of 2011. At that time the City was launching a “local area plan” processes in four rental neighbourhoods in order to create a framework for approving large-scale condo developments. The four neighbourhoods were Marpole, Commercial Drive, the West End, and the Downtown Eastside. After three years of planning beginning in January 2011, five of the original seven towers in Chinatown are already underway, and this week the remaining two were also approved: two special “higher building sites” at 425 Carrall Street and 99 West Pender with zero social housing requirement in each. In addition, Vision secured policies for many more condo developments along the Hastings Corridor. Where the NPA failed to deliver to the real estate industry, Vision has succeeded. While the LAP opens up most of the Downtown Eastside and Chinatown to condo development, the policy designating the Oppenheimer district (DEOD) as a rental-only zone preoccupied much of the debate at City Hall last week. The effectiveness of the rental-only zone hinged on the new proposed definition of social housing. The plan presented to council on Wednesday recommended redefining social housing such that an entire development counts as social housing so long as 30% of tenants are in “core need,” even if the remaining two-thirds are at market rents. However, even the one-third core-need wasn’t intended for low-income people. As pointed out at The Mainlander, so-called core need is actually defined as market rental, at $875 per month. This policy meant that there would be no guaranteed provision of welfare rate social housing in the DEOD. in which at least one third of the dwelling units are occupied by persons eligible for either income assistance or a combination of old age security pension and Guaranteed Income Supplement and are rented at rates no higher than the shelter component of Income Assistance. This amended definition means that in any “social housing” units built in the Downtown Eastside, 1/3rd of the units will rent at shelter rate and 2/3rd of units will rent at undefined market rate. However, this remains a huge set-back from the original definition of social housing prior to the LAP, which targeted 100% of social housing units toward “senior citizens, handicapped persons or individuals or families of low income.” Further, it is logically absurd to define “social housing” as 30% social housing. In the Oppenheimer District, where the 60/40 rezoning policy will be implemented, the percentage of social housing at welfare rate shifted on Saturday from being a target to a legally binding bylaw. However, the remaining two-thirds of the 60% social housing component will be at average market rents and the 40% market component has no caps on upper rent limits. This means that the end of the day, at least 80% of all new housing in DEOD will be market priced gentrification. This will be still be sufficient to cut into developer profit margins and slow the rate of gentrification – but it will not be enough to stop the process of gentrification and displacement. If nothing else it will buy the DEOD community more time to build a plan, strengthen their resolve, and mount a renewed campaign against the LAP on behalf of the DTES as a whole. Outside of the Oppenheimer District, social housing requirements are minimal so the amount of welfare-rate housing will be much less than 7%. On Saturday councilor Adrianne Carr’s proposed that the definition of social housing mean, simply, housing renting at the welfare shelter rate. Vision and the NPA voted down Carr’s motion. Throughout the hearings the low-income community argued for strong housing and zoning requirements capable of counter-balancing the gentrification-effect. Gentrification causes the loss of affordable rental housing. Unless the threshold of inclusionary zoning and new social housing is sufficiently high, affordable housing is sacrificed to upscaling, demolitions and rental conversions. 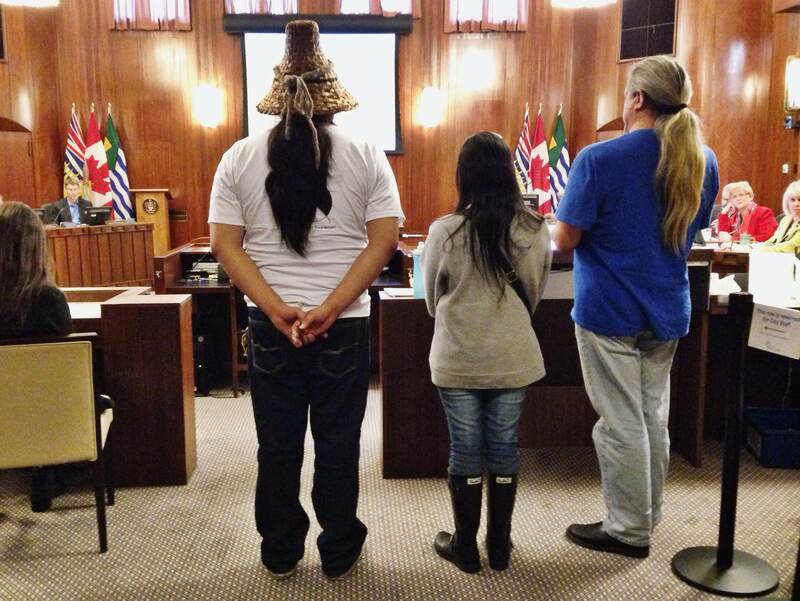 This process has been underway in the DTES for a few years, and most recently in the DEOD. The LAP weakens existing protections for affordable and social housing and is therefore expected to worsen the housing crisis. The term “revitalization without displacement” is mentioned only once in the 300-page Local Area Plan. Although 36% of Downtown Eastside residents who need social housing will be dispersed across the city, on page 51 the authors of the LAP argue that the “revitalization without displacement” principle is upheld in a “city-wide context” because tenants will remain within the city. This is a subversion of the concept of “no displacement” in planning documents throughout the 2000s, which has always referred to not being displaced from one’s home and neighbourhood. Posted in City Hall, Gentrification, History, Homelessness, Housing. Bookmark the permalink. Gots to say folks, with the exception of brother King, ain’t much racial diversity in this leadership mix? Like Marvin Gaye would say in Inner City blues, “makes me wanna holler.” Or as anti-displacement struggles in Harlem shout out to white folks trying to get in and lead them: “Hold on, wait a minute, let us put some colour in it!” This randomly chosen, spontaneous picture shot at the start translates into the reality of the lack of leadership coming from communities of colour, or a racially diverse movement building strategy and multi-lingual engagement project in the DTES anti-displacement struggle. In fact, once again, too many white privileged folks are the shot callers. (You wouldn’t be the shot callers in prison or on the Rez, the ghetto, barrios, Chinatowns, or in the housing projects, though — now would you?) Last time I checked demographics in Vancity, hella folks from Asia, Latin America, Africa — and Afro-Canadians, South Asians, Caribbean peoples’, Aboriginal peoples’, Metis and even racialized Americans, and homeless people, undocumented immigrants and SRO tenants were chock full in this town. Certainly central here are Aboriginal activists, but the absence of a genuinely deep flow and flavor coming from other folks of colour in the DTES anti-displacement leadership ranks wouldn’t be tolerated in most major social and political struggles against gentrification and displacement in the urban centers of the world. Travel to Los Angeles, Seattle, New York, Toronto, Paris, Rome, Montreal, San Francisco, Boston, Mexico City, Sao Paulo, Lagos, Shanghai, etc. and so forth….and see. Damn, makes me wanna holler, yo. Do not look for color race age,, instead look for intent. If the intent is there nothing else about the person is relevant. Thanks for the excellent report. People around the world will be looking at this. If you guys don’t mind, it would be nice to have the acronyms presented to the outsiders for that matter. Adriane Carr’s proposed amendment (“that the definition of social housing mean, simply, housing renting at the welfare shelter rate”) was imminently reasonable. But I’m guessing that would have prevented the city from being able to water down the social housing requirements of any new developments. There is a certainn quite evil here. Vision seems to misunderstand our Canadian Values. They and their ‘friends’ do have a perfect vision of American values. The last couple of years seem like an exercise for an Ukrainian takeover. The truth is we take care of our less fortunate ( poor) better than most now and we are still trying harder, bravo! Here we are trying to find solutions and seeing if we can make it work better, bravo! A simple solution would be to raise the housing allowance to meet the real rental rates, if the allowance was say $1,000 per month how would that change the equation? Then the social poor could rent anywhere and we support them? Find that too expensive? Maybe it could be funded out of other housing builds or some creative RRSP scheme. Please do not think I expect the government to pay, but if ” developers” are profiting maybe they can help pay. Or maybe savings in other government costs can be shifted. Bravo, let’s keep trying, some one will get it right and my guess is it will be someone who is trying new ideas. You need district elections of your city council. Not a panacea, but sure would help. agree with the NPA on every issue anyway and none of them will reward Vision for abandoning the poor. They’ve knocked down the skid row and towed it away. they’re rolling the bums out of town”. (Not meant to be calling the people of DTES bums, just a song about this process).